Recombinant full length protein, corresponding to amino acids 1-282 of Human Rad1 (NP_002844). Our Abpromise guarantee covers the use of ab168397 in the following tested applications. Component of the 9-1-1 cell-cycle checkpoint response complex that plays a major role in DNA repair. The 9-1-1 complex is recruited to DNA lesion upon damage by the RAD17-replication factor C (RFC) clamp loader complex. Acts then as a sliding clamp platform on DNA for several proteins involved in long-patch base excision repair (LP-BER). The 9-1-1 complex stimulates DNA polymerase beta (POLB) activity by increasing its affinity for the 3'-OH end of the primer-template and stabilizes POLB to those sites where LP-BER proceeds; endonuclease FEN1 cleavage activity on substrates with double, nick, or gap flaps of distinct sequences and lengths; and DNA ligase I (LIG1) on long-patch base excision repair substrates. Isoform 1 possesses 3'->5' double stranded DNA exonuclease activity. Belongs to the rad1 family. 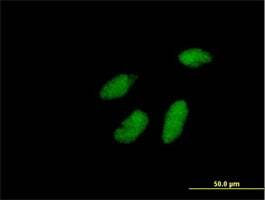 Immunofluorescent analysis of HeLa cells labeling Rad1 with ab168397 at 10 µg/ml. ab168397 has not yet been referenced specifically in any publications. Publishing research using ab168397? Please let us know so that we can cite the reference in this datasheet. There are currently no Customer reviews or Questions for ab168397.